the things one can’t talk about and the things one can. Some few points I’ve been meaning to deal with properly have been swept under the carpet. It leaves me wanting to say things that I should not, and over all in most cases it’s not my place to say anything at all. Like my sister. She’s fabulous and wonderful and I love her dearly but when she had a “health scare” around christmas and an “all clear” around my birthday I wanted to cry with joy and tell you all but it was not my place to discuss any of it. No matter how much it hurt or the joy at the end finding out she is alright. It was like going through mum’s issue all over again but not the same because its my sister and her private stuff. Which is why when we had our pamper day together it was THE bestest day ever and got us close again like I would like to be more often. Being a full-time mum and wife and full-time worker and now having a 50Kg puppy (7 stone 12 Oz) my sister is not just amazing but busy, so getting her away from that and treating her to a day out was very special. I still can’t believe she’d not been in a sauna or had a massage before that. He’s well, and he’s been traveling on and off since autumn last year. Now with 2 trips to Lanzarotte and 2 to Germany under his belt, he’s not stuck indoors. The decorating may be taking longer than expected to finish but he’s got the rest of his life to finish that. Plus who wants to watch paint dry all winter. I’m super proud of him for getting out there and “having a life” as they call it. Now on to something I can talk about and I forgot to get covered in the last post. The holiday post was nice and positive but before going I had to get the cats to the cattery. It nigh on broke my heart to do it though. I love our cattery, I love our cats and normally have no problems but recently Jasper has taken to being very very upset when transported. He pants, he howls and sits with his mouth open. Very highly stressed. The cattery is 20 miles from our house on back roads which means around 30 minutes in the car. Far too long for poor Jasper. Firstly he got upset then Otis got upset with him and started biting Jaspers neck to shut him up. Then when he didn’t calm down Otis started howling too. Not a comfortable journey. I told the lovely cattery owner what went on and she was great. I got a text message on holiday saying that the boys were calm and happy and were “assisting” in her cleaning. Also she contacted her vet and had the boys looked over, then contacted my vet to double-check there would not be any complications with giving any calming tablets. She then sourced the tablets and gave them to us for free. Also Scotty was in the car on the way back to keep the cats company which also helped but definitely on the way back Jaspers heart was not in it for complaining. He tried but he did not have the panting or the panic in him. Once home both Otis and Jasper flopped out on their backs on the lounge floor as if they were spaced out of their brains but happy. Lots of cuddles and love and they were both almost drooling in happiness. Which reminds me O&J are both due their annual vets checkup and immunizations. I’m really not looking forward to that car trip, although its only 15 minutes at most, I can’t medicate them on a vets visit! Well I got as far as last weekend didn’t I? ah yes. Saturday we layed about and watched FILMS!! kungu fu panda. Love it! and Ratatouille. Loved that too. The whiskers in HD are just frabulous. Sunday we had a birthday party at my sisters house. We got to meet slobber dog, well Shumba but because I forgot to get up from sitting down in time he managed to wipe his jowls all over me. Slobbertastic. My brother brought over some more Plums and my granny and auntie supplied apples on Friday. 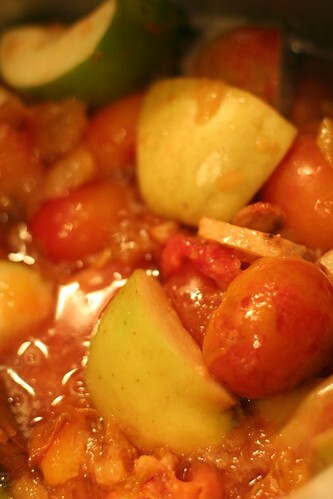 So on Monday night Scotty and cooked plums and apple sauce. We now have a glut of this too, some of it frozen. I got to knit night and it was lovely to see just the few stalwarts seeing through the quiet season. Work was busy all week but it’s not worth writing about. It pays bills and really its still a good job even when busy. At least I dont watch the day going by and wish I was elsewhere. I do sorta but not really wish I was doing something else. I nipped in to town one lunch time in the week and got hold of loco roco 2 which is fab. I loved the first game and now the second is even better. knitting progress is almost non existant but that is because I have a new spinning wheel. I’ll do that on my next post. 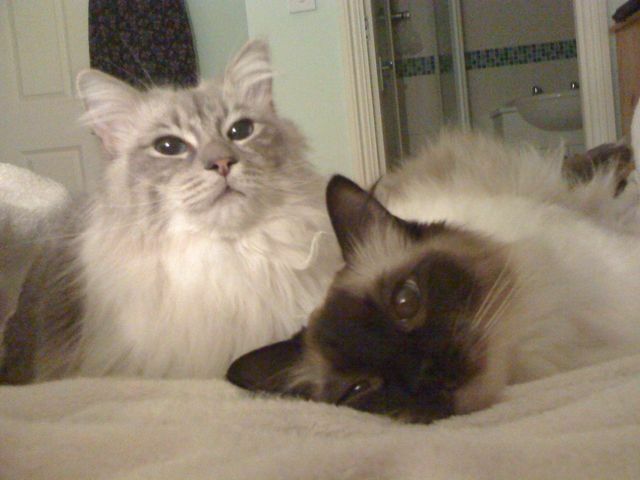 Because we went away at the weekend AM came over and looked after Jasper and Otis for us. This pic were taken the night before we went. They both came up for a cuddle in the middle of the bed. AM informed us that Jasper was a star and purred for her lots. Otis on the other hand was slightly standoffish mainly because it was not his normal routine. Although when given the choice to eat some very expensive food he meowed with vigor. They looked smart and well looked after when we got back due to lots of good brushing. Well they were happy to see us back and seemed ok early in the week returning to the standard routine. Then last night they decided it was fight night. Probably something to do with the massive rain storm we had nearly all night. They were not settled and woke me several times. This is why no matter how cute cats are they’re just like kids and will wake you up in the night and require “sorting out” In this case luckily the sorting is just a “SHHHHH!” and return to slumber. Next time I’ll be shutting the bedroom door and squirting them with water if they scratch. Still they don’t do it often. Still love them even though I could have strangled them both at 4am. Things I been up to lately. I had Lunch with Mary last Thursday. Mary made me squee. She’s good like that. It is so nice to catch up with an old friend when she’s moved away. We sat out in the glorious shade, heh, we’re not stupid. Ate Italian pasta at the local zizzi’s and relaxed in to the lunch. The squee was because quite a while back I gave Mary some of my wool stash. Stuff I may have already used bits of, other bits I was never going to get around to using. Anyways Mary did what any good knitter would do. Knitted for a knitter. NOBODY knits for a knitter and I was so super happy to get a new pair *cough* of socks. I cough because the pair was actually 3 socks due to Mary having some random half balls and she used up all the yarn. Now I have 3 lovely socks and I’m super happy. One thing I’m no so happy about are snails in the garden. Although this guy is cute and rather blorpular, I’m still at odds with the snails in my garden. He was stashing away in the watering can waiting for me to pour him over my little joyous vegetables. They keep eating my veg before I can! Still he is so cute I had to show him to the cats. 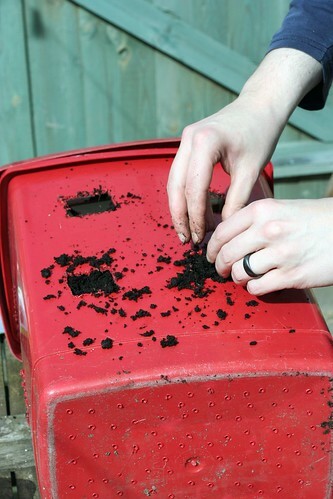 (he came out of his shell when I filled the watering can and stayed out for some fresh air. Otis was not too sure. 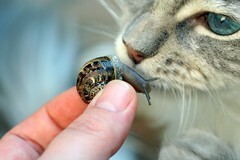 The snail was interested in him though. Otis made a fast escape after this encounter. which is odd because he plays the big super confident “I get my way” in the house. 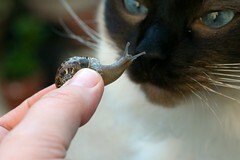 The woim or even the cat/snail turned that one round. He’s a big wuss. Now Jasper is the contemplative sort and will trust almost everything you give him. He was having a good ol’ sniff of the snail right here. I sadly missed getting a photo of him licking the poor snailio. Still I do quite enjoy intrepid inter-species snorgling. 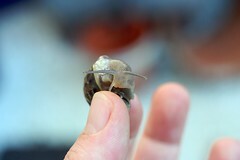 Sad to say though this snail is probably not with us any more. Some get placed in my wormery to live on rotting veg. Others, if I spot them eating my lettuces get hoofed over the fence to land in a car park. Next update includes home grown vegetables, as soon as i get the photos off the camera. hello *tap tap* is this thing on? ah. well, we’ve been on holiday. I have no better excuses. Lots has been happening but very little blogging. I havent even put any photos on flickr for ages. firstly I’ve had two great visits to my family. A great bbq, and also my brother installing a tyre rope swing in his woods which is just fabulous. Very fun and only slightly scary. Our lovely week and a bit off work ended up being a very large splurge and means that we’ll not be buying any new toys for a while. Most enjoyable, splashing the holiday cash. Not something I do without saving for first. I took the cats to the cattery. They appeared to have a good time there although we missed them I’m not sure they really missed us. They even had a quick checkup at the vets and were doing fine. I drove to Southampton 7.5 hours on a Friday afternoon of a bank holiday weekend. It was not fun at all. Spent some lovely time with the in laws and all of Scotty’s family. Another bbq and playing with nieces. A trip to Ikea, which was my very first and purchased some new house furniture. Then a really good ride back home early bank holiday Monday. We even picked up the cats the same day, got home and collapsed. After a couple of days bimbling about and sorting ourselves out we took a day trip to London on the train. I wanted to go and find my new handbag. I then also bought a new laptop bag which is not the same colour but they’re a good set together. Scotty and I walked for miles around London and visited the British museum and the tate modern and stayed out for dinner because the off peak tickets meant we needed to leave later. We went for Yo Sushi, which was a new experience and amazingly cheaper than I expected. The garden is coming along nicely. Something is eating some of my veggie plants and its a phantom night eater. Other than that the spuds are sprouting all over the place. Herbs are in abundance and everything else is ticking over and will probably not grow big enough to fruit this year but it is still very early. Otis has taken to being a pain in the arse when it comes to eating. If he does not like the food he will stand and moan at you CONSTANTLY every few seconds. I annoyed him the other night by being nice and still not feeding him the other food he wanted. Eventually I saw him huff at me. No kidding this cat had one frustrated strop which was just not being listened to. Poor fella. At least he’s not the night scratcher which leads us to…. Jasper. Now where Otis is annoying on food Jasper is lovely and just gets on with it. Where Otis is lovely at night and settles well on the bed, Jasper is the complete oposite and spends several hours of the night running in to the bathroom, scratching the cupboards and running away because he knows I’m going to reach for the spray bottle. The spray bottle has become a game to him. This is not good because I then have lots of broken little patches in my nights sleep and I am queen of sleep and would like to have an unbroken night some time soon. Any suggestions gratefully appreciated. Please understand I cant shut them out of the bedroom because they would just scratch the bedroom door. I cant then shut them out of upstairs because the house is just not built like that. On to the lovely Ikea things we bought. We’ve got a new side board thingy table under the telly that looks fab. Then a new set of stools and a bar for the kitchen. Then after all the handbags, train tickets, meals out for family and cinema tickets for my sisters husband for his birthday and us of course. I’m mostly spent out. We went to see Star Trek and having been a fan for most of my life I love this new movie. I really do like most of what Zachary Quinto does. I think he’s a great actor and makes a very good Spock. Then Scotty went out on Sunday after all the splurging and bought himself a canon 5D, which I must admit appears to be a great investment of money but a WHOLE LOT MORE than I was intending on spending this month. Still we’re quite the modern couple and his money is still his money and then I get to play with all his toys. YAY! plans for next month include a car service. ARGH!! and catching up with the knitting. Not much of it mind you. The sweater has stalled at the first sleeve. BUT the beautiful shawl is slowly turning in to a giant bed spread…. More on that next time and I hope that will be sooner rather than later. 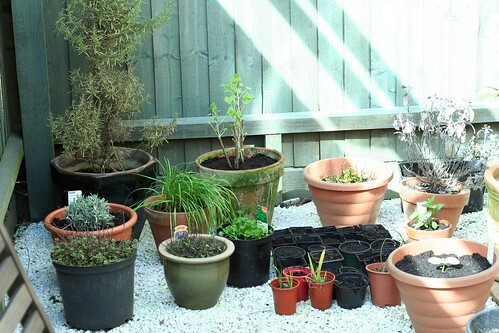 Scotty and I spent a day in the back garden and after a few small purchases from a garden retailer we stocked up and potted as many vegetables as we could. I kept well away from cauliflowers and broccoli that we attempted last year. This year we have our regular stock of herbs and then courgettes, bok choi, beetroot, one small strawberry, butternut squash and potatoes grown in a converted bin. We even planted fresh cat grass for our boys. The last years crop completely died out. knitting has almost died a death with me. I’ve not even made it to knit club in weeks. I think I still love it but I got stuck at the armpits on the jumper. The shawl I was doing simply does not add up and the poor thing is waiting for me to have enough patients to sit down for a good couple of hours and count religiously until I can get it all to a working number. Not at all fun. I did however complete two iphone cosies for my new fabulous white iphone. One to wash and one to wear. I’ve got photos on the PC at home but I’m doing this in my lunch break. I’ve seen the family two weekends running. My gran came up to visit with my aunt and very kindly gave each of us a bit of money which has been fired directly at our hopefully ever decreasing mortgage. Not huge amounts but big enough to make me feel better. I don’t need her money but apparently neither does she so its gone to good use. I found out the posh sushi place in toombland Norwich does takeaway.. no really. That was the best £30 (for two) I’ve ever spent on takeaway food. I just LOVE sushi. I get cravings but only once in a while. Its a good job, its way too expensive to buy regularly. I managed to shrink in to a pair of “hopeful” size trousers in the past week. It’s only taken 8 ish years since I bought them. They were only £2. Bargain even though I’ve now only worn them once. I’ve had a big new project at work. Some comparison of ID against what sits in one database against another and against asset and all that gubbins. Nothing that can be done by a computer because none of the systems inter-relate. Once I’d finished the task I then had to re-write the process. Good fun but a real mind bender. Something to stick on my CV me thinks. I had a day trip to Cambridge for work. I wish it was as nice as it sounds but I was in the office from 8.30am until 3.15. harsh, I came straight home for a nap. This past bank holiday has been wonderful. I started sewing a pair of trousers for myself on Friday. We went shopping in town on Saturday for new shoes for Scotty then had a marathon movie session with finding nemo and quantum of solace. The movie may not be the best for cohesive plot but the action is great on blue ray. Then I had a bit of a cooking frenzy in the evening. Sunday I supplied the family with the nut roast I cooked the night before. We all went for lunch at my brothers house. Then went on to Felbrigg hall local to him to take the kids on a question trail egg hunt. It was great fun and nice to see all the family having a day out together, even the dog could join in to a point. Shumba is fast becoming a very loved part of our family. Monday I got back to the sewing machine and completed my trousers. I’m happy mostly but the waist band is terrible. It does not hold correctly and the internal stuff for stiffening I bought appears to be the wrong sort and has caused scrunching. Apart from that they were wearable on Monday for work which means I spent the whole day going round asking people if they liked my new red trousers… and that I made them. I am such a smug ba*”&$%tard. Now I’ve got a few plans in the making. An early May holiday which the cats are now booked in for their holiday too but also their yearly jabs before their holiday. Speaking of which Otis and Jasper are good some nights but last night I could have booted them both out the top floor window. I am not good when I’ve not had enough sleep and its all their fault. If you want to see our boys visit Flickr, their latest photos are during mid groom here. Other plans include the yearly car tax and service in May. Excitamente!